Home > Transportation > EVs@theMarket 2018 a Huge Success! The final numbers are in! This year’s EVs@theMarket event far surpassed last year’s event in basic metrics as well as photographs and videos produced. Conversations with electric vehicles owners numbered 1078. There were 27 owner-volunteers displaying their electric vehicles (three more than planned via a little squeezing-in). By the end of the afternoon, folks had been lining up for a total of 256 test ride and drives with retail vehicle dealers in the 10 dealer/vehicles listed here: Niello MINI Cooper‎, Niello BMW i3, Tesla Model X, Tesla Model 3 (2 vehicles), Shottenkirk Honda Clarity, Hanlees Chevy Volt, Hanlees Chevy Bolt, Hanlees Nissan LEAF, and Hanlees Toyota Prius Prime. EVs@theMarket event was brought together by Cool Davis, SacEV (the Sacramento electric vehicle owners group), the Dave Electric Vehicle Association (DEVA), the City of Davis, and a whole host of important sponsors and partners including the Yolo Solano Air Quality Management District, PG&E, and Davis Downtown. 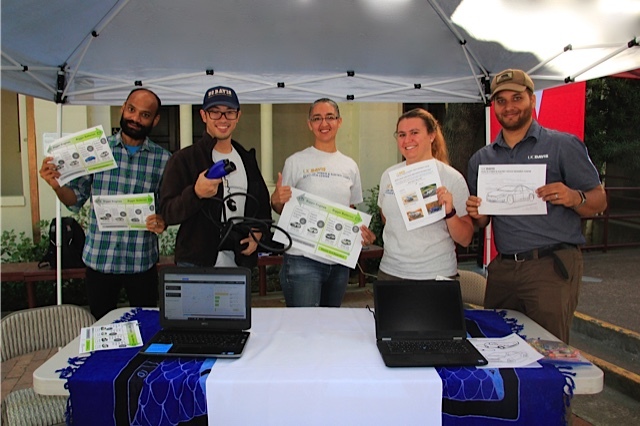 Test drivers earned $10 worth of Farmer’s Market bucks for test driving the vehicles, and participants engaged in workshops titled EVs 101, Buying a Used EV, and Driving on Sunshine (pairing rooftop solar with an electric vehicle). Folks also jumped on electric bikes offered by local and regional vendors and chatted with members of the UC Davis Plug-In Hybrid & Electric Vehicle Research Center as well as a representative showing off the new Tesla “Powerwall,” a home based battery storage system. A recent Cool Davis article about the state of “range anxiety” might be of interest for anyone wondering how to incorporate and EV into their lives. Check out this Enterprise article about the new Chevy Bolt, the newest all electric vehicle with a longer range than previous models. At one point during the excitement of EVs@theMarket, City of Davis council members took a short break from their day-long planning retreat at the Davis Senior Center to pile in to one of the test vehicles. The newly formed Davis City Council took a moment out from their planning retreat to pile into a Tesla for EVS@theMarket 2018. Photo credit Leslie Crenna. Check out the full photo gallery on our Facebook page. More pictures are on their way. Listen to all the interviews on our Facebook video page. In terms of EVs, the City has in fact set some ambitious EV goals. The City wants 2500 electric vehicles in local use by the year 2020. An ongoing planning effort to add electric vehicle charging stations citywide is working in concert with that effort. According to the State Clean Vehicle Rebate program website and an estimation of vehicles that have not received a rebate or were purchased before the rebate program began, as of Aug 16, 2018, approximately 1140 total plug-in electric and fuel cell vehicles are active in the Davis community. That means we’re 46% of the way toward the City of Davis goals of 2500 by 2020. If we are going to reach the 2020 goal as a community, we will need to nearly double the number of electric vehicles currently on the streets in the next two years. Check out the Cool Davis Driving Electric web page for updates on our progress towards these goals. The end of the year is a good time to buy an EV in order to get the quickest turn around on federal tax credits. Read a fabulous article by Cool Davis volunteer Mike Kluk on all the rebates available including a special rebate expiring at the end of this month on the Nissan Leaf for UC Davis affiliates. A large contingent of EV owners mostly from SacEV and the Davis Electric Vehicle Association were on hand to answer questions about their vehicles. Photo credit Johan Verink. Three Teslas were popular but Honda, Toyota, Chevrolet, BMW, Nissan, and other makes got plenty of attention from happy test drivers. Photo credit Johan Verink. Thank you for to all our sponsors, exhibitors, dealers, electric vehicle owners, and volunteers! Special thanks go to our event partners thank you to Yolo Solano Air Quality Management District for providing funding and exhibiting at the event. Thank you City of Davis for allowing the street closure and use of your market space to make this such a great venue for the day. Thanks to City events staff especially Bob Bowen & Sonia Chavez, as well as City Safe Routes to School Coordinator Loretta Moore, and Bike and Pedestrian Coordinator Jennifer Donofrio for all your behind the scenes help and advice. Thanks to the Davis Community Church for its generous support through use of its space. Particular thanks go to Jewel Payne, the DCC Church & Society Ministry, and Pastor Chris Erdman for active support of Cool Davis’ work in our community! 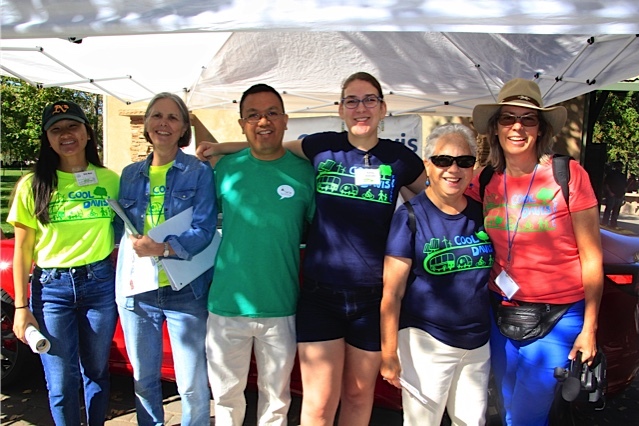 Thank you to the Davis Farmers Market leadership Randii McNear and marketing staff for your support as well! We are especially grateful for the work of all the Cool Davis and SacEV volunteers! Thanks to Robert Poeschel, Guy Hall, and Chris Granger for all the logistical planning and work ahead of time to organize the owners and dealers and to plan the event. Thanks for your steady and consistent leadership and wisdom to move through all the details to make this event successful. Special thanks to Barbara Gardener for coordinating the care and feeding of all our volunteers! The food was great, and the fresh coffee so appreciated by the early birds. Thanks to Robert Poeschel, Tim Tutt, Jim Schaal, John Johnston, Martha Sperry, Katrina Sutton, and Sim Bun Cheng for setup, take down, and street management. Sim, thanks for all your work before the event to coordinate volunteer signups, volunteer placement at the event, and setup and take down! Thanks to Lauren White from SacBreathe for coming out to learn the ropes of these events and for helping us set up! 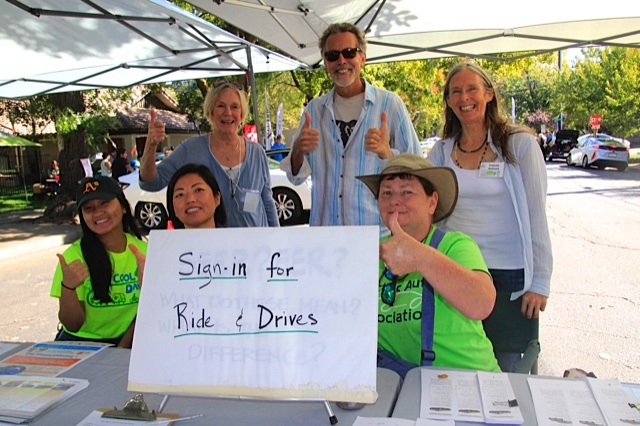 Special thanks to our Ride & Drive registration crew (Maria Cartwright, Lynne Nittler, Kerry Daane Loux, Frances Burke, Frances Andrews, Victoria Hall, and Brian Guerdat) for your patience in getting organized and your excellent handling of the Ride & Drive process! 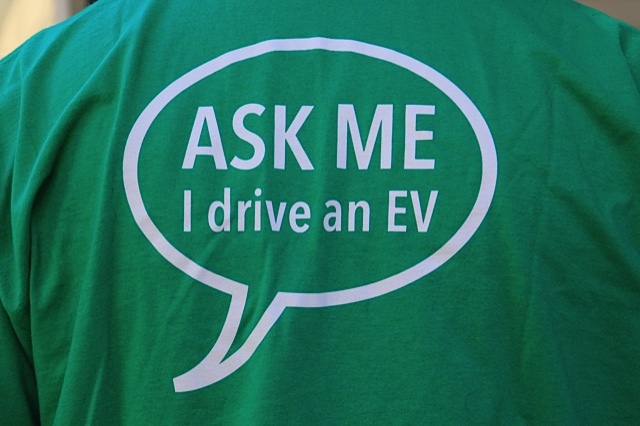 Thanks to our EV Owners for sharing their cars and experience with the Davis community! The owners include David A., Russ Allen, Kathy Applebaum, Stacey Barhydt, David Becker, Larry Burdett, Jim Byard, Richard Bode, Alex Campbell, Matthew Chan, Eugen Dunlap, Susan Gjerde, Guy Hall, Michael Hays, Tom Ikelman, Joseph Jefferson, Alan Jenn, Peter Mackin, Carol Lee, Margee McDonnell, Marc Manashil, John Neil, Ken Rothaus, Ben Sher, Katrina Sutton, David Tokarski, Jon Ruth, and Denae Wagner. Thank you Robert Poeschel for your Cool planning & management of all these cars fit in such a tight space! Thanks to our workshop site coordinator Marsha Baird and to our workshop speakers Heath Carney, John Walter, and Eugen Dunlap! Thank you to our partners and exhibitors for sharing their information and expertise! These partners include Yolo Solano Air Quality Management District, Safe Routes to School, City of Davis Bike and Pedestrian Programs, Clipper Creek, Unitrans, Ken’s Bike and Ski, Tesla Power Wall, California Clean Vehicle Rebate Program, UC Davis PHEV Center, and Jump Bike. Thank you to our communications team Leslie Crenna, Emily Estrada, Laurie Friedman, Mike Kluk, Barbara Gardener, Johan Verinks, and Robert Poeschel for preparing PR and special articles, conducting interviews, taking pictures, and tweeting during the event! 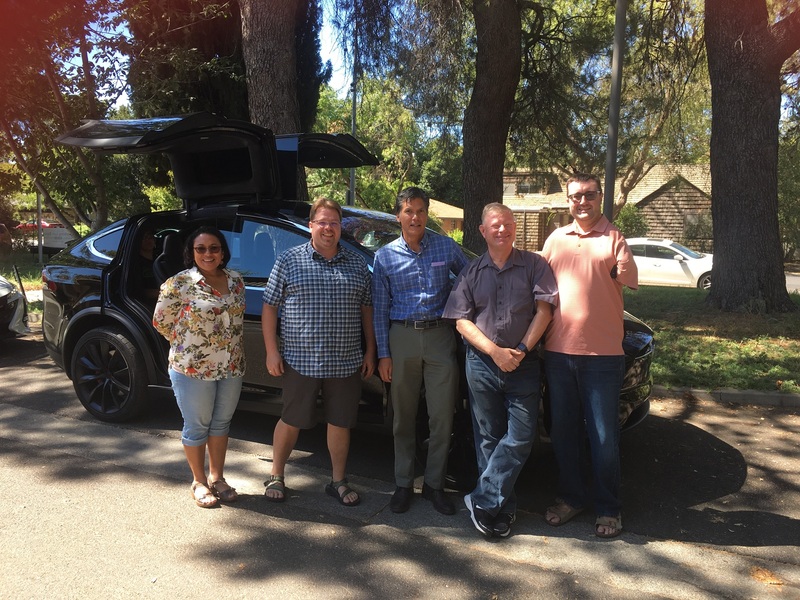 Thanks to the dealers: Niello Folsom for bringing their Mini Cooper and BMW i3; to Hanlees Davis for bringing a Toyota Prius Prime, Chevy Volt, Chevy Bolt, and Nissan Leaf; to Tesla for bringing the Tesla X and 3, and to Shottenkirk Honda of Davis for bringing the Honda Clarity. We look forward to even more successful events in the future!